a tooth of the first set of teeth, comprising 20 in all, that erupts between 6-24 months of life. Any of the temporary first teeth of a young mammal. Also called baby tooth, deciduous tooth, milk tooth. One of the first set of teeth, comprising 20 in all, which erupt between the mean ages of 6 and 28 months of life. Synonym(s): dens deciduus [TA] , baby tooth, deciduous dentition, milk dentition, milk tooth, primary dentition, primary tooth, temporary tooth. Everyone has two complete sets of teeth during his life. The 20 primary teeth are the first set of teeth a person develops. They exfoliate by age 14 and are replaced by the 32 permanent teeth. The permanent teeth include the following: incisors, canines (cuspids), premolars (bicuspids), and molars. On average, a child should have 6 teeth at 1 year, 12 teeth at 18 months, 16 teeth at 2 years, and 20 teeth at 12 years. Some children are born with a few erupted teeth; in other children the teeth may not appear until 16 months. Health care professionals should assess patients’ teeth and gums during physical examinations, educate patients about routine dental hygiene (brushing, flossing, gum stimulation, use of oral rinses), and refer them to a dental professional for dental caries, eruption anomalies, or periodontal problems. A permanent molar tooth that arises without deciduous predecessors in the dental arch. The central and lateral incisors and/or the canines, located adjacent to the midline of the maxilla or mandible. A permanent, premolar tooth. 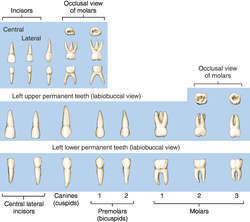 There are eight premolars, two in each quadrant (four in each jaw) between the canines and molars. Premolars have two or three cusps on the occlusal surface. A tooth whose enamel and dentin are fractured. Any of the 20 teeth that make up the primary dentition, which are shed and replaced by the permanent teeth. A tooth sensitive to temperature changes, sweets, or percussion. It may exhibit gingival recession, exposed root dentin, caries, or periodontal disease. Popular treatments for hypersensitivity include topical varnishes, sealants, and topical fluoride applications. Other treatments include application of silver nitrate, formalin, glycerin, strontium chloride, potassium nitrate, calcium compounds, sodium citrate, and potassium oxalate. The patient can reduce sensitivity by a regimen of plaque control, dentifrice with fluoride, self-applied fluoride, and control of diet. A tooth unable to erupt due to crowding by adjacent teeth, malposition of the tooth, or developmental disturbances. 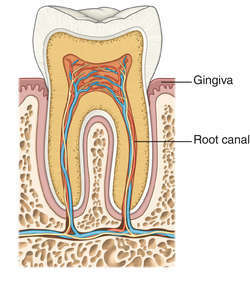 A tooth soft in structure, white in color, and esp. prone to decay. Any of the 32 teeth that develop as the second dentition and replace the deciduous teeth. A yellowish tooth that is naturally hard and highly resistant to caries. In dentistry, a permanent tooth that succeeds (replaces) a normally erupted deciduous tooth. It includes the premanent incisors, cuspids, and premolars. The deciduous molars are replaced by the permanent premolars, which are not succedaneous teeth. Any of the third most-distal molars on each side of both jaws. These four molars may appear as late as the 25th year or may never erupt. Signs and symptoms associated with primary tooth eruption: a clinical trial of nonpharmacological renmedies. Primary tooth pulp therapy as taught in predoctoral pediatric dental programs in the United States. banksi but posterior intermediate tooth is imperceptively to visibly separated from primary tooth (Fig. 1) Most guidelines recommend that a primary tooth not be replanted due to possible damage to the permanent developing bud after insertion. An over-retained primary tooth is a "baby tooth" that is still in position when a permanent tooth is erupting into the same space. However, the secondary (supernumerary) tooth of USNM 2225, which is lingual to the primary tooth, is badly deformed. Papillon-Lefevre syndrome is associated with marked destruction of alveolar bone with premature primary tooth loss. Pulpotomy in a primary tooth is defined as a procedure performed when the coronal pulp tissue is exposed by caries during removal or trauma. Our results suggest that exposure to xylitol (8 grams per day) in a twice-daily topical oral syrup during primary tooth eruption could prevent up to 70 percent of decayed teeth," the authors said. The researchers examined the effects of Claritin-D Syrup, a popular choice for chronic childhood illnesses such as flu and allergic rhinitis, on samples of primary tooth enamel (Gen.
Clinical trials of fluoride supplementation have consistently demonstrated prevention of 32%-72% of cavities in primary teeth and 38%-81% on primary tooth surfaces. All children who had got one primary tooth extracted during a one year period were included in the study.